There’s no excuse not to take care of an infected tooth with a root canal treatment. Our knowledgeable and friendly staff at Britannia Medical Center - The Enclave will give you all the information you need to feel safe and relaxed going into a treatment. Anemia is a condition that is diagnosed when a person does not have enough hemoglobin. Hemoglobin is a protein on red blood cells that carries oxygen throughout the body. The body needs iron in order to make hemoglobin. One of the major blood disorder diseases that affect people of all age, from all walks of life ,from all strata’s of the society is a disease called anemia. Our blood in the body is consisted of two different forms of cells amongst the others. The white blood cells or the WBCs and the red blood cells, i.e. the RBCs form the main part with others like plasma and platelets existing in small amounts. Now often a situation is caused when the red blood cells in our blood decreases and this lack of proper amount of red blood cell causes a medical condition called anemia. While white blood cells help in clotting of open bloody wounds and gashes, the red blood cells helps the blood in carrying oxygen to the lungs and hearts, therefore dominating their existence over white blood cells. Often too much blood loss can cause an extreme decline in the blood cell count which mainly affects the red blood cells as it oozes out. Often at times there is internal blood loss too which accounts for the same. The bone marrow that runs along your back is the producer of hemoglobin which in turn gives color to the blood. The blood, the red cells then supply oxygen taken from the hemoglobin. The marrow in the back needs an element called iron with the help of which the hemoglobin is produced. 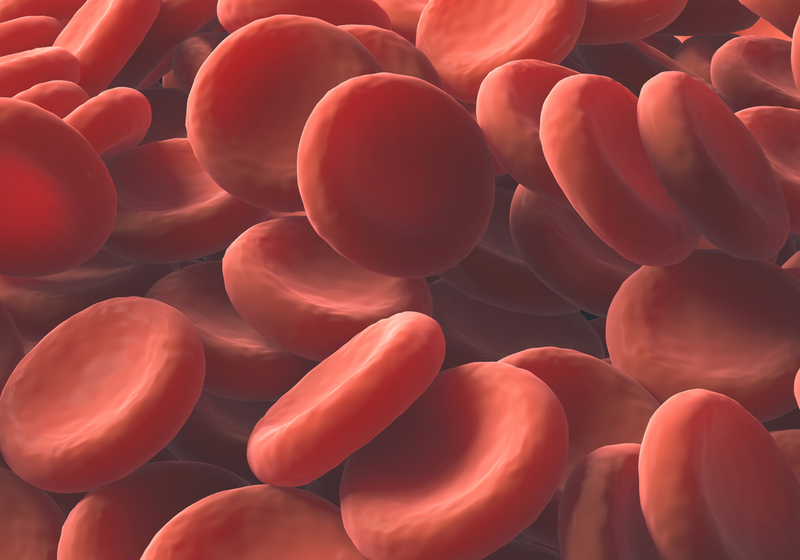 Lack of iron in the body causes lack of hemoglobin which is why RBC count might get affected. Usually red blood cells are doughnut shaped oval and flattened in structure but often at times due to heredity mainly, the hemoglobin cells formed or existing in the body are differently shaped. The gene passes on and the deformed red blood cells in the body suffer a premature death. This in turn causes lack of red blood cell lost and sickle cell anemia is formed. Often women face certain problems where a heavy menstrual cycle or too much blood loss during pregnancy might be the reason why you are a victim to anemia. This is why if your menstruation persists for a longer time than before, and if you experience heavy blood loss it is better to get a check up. Multiple pregnancies are also a weak point. Often problems or diseases affecting the bone marrow or the bone marrow cells such as leukemia can affect blood production in the bone marrow which in turn causes stunted hemoglobin an hence red cell production. Then there are often days when your red blood cells get destroyed faster than you marrow can produce making an onset of anemia for sure. Alongside iron, certain essentials like vitamin B-12 are needed by the body. The lack of these certain vitamins in the body is known to decrease the red blood cell count causing lack of RBCs which is yet another reason anemia can be formed. However there are often people who do consume vitamin but yet suffer anemia due to their bodies’ incapability of using these vitamins properly. Then a condition called vitamin deficiency anemia is formed. 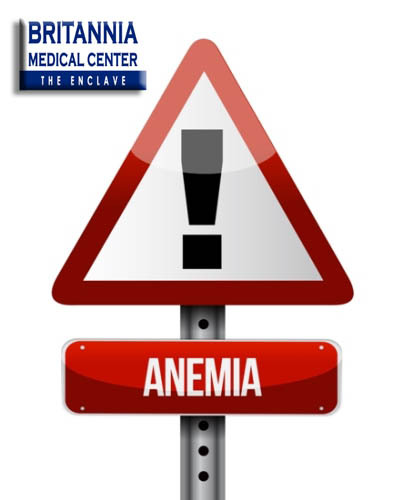 Often there are subtle symptoms that indicate the presence of anemia. Here are some of the symptoms you should look out for. One of the main symptoms of anemia is shortage of breath often acute in nature. This is because due to lack of proper oxygen giving red blood cell, the proper amount of oxygen cannot reach the lungs causing a heavy chest or breathlessness. This is often accompanied with episodes of heartaches and small chest pains. Once you are down with anemia your skin starts losing its natural blush causing you to look pale and paler. Your skin becomes dull making it an inevitable gesture for you to go for an anemia checkup. Without the proper oxygen enriching the heart and lungs, a common scenario of fatigues washes over you. You feel exhausted very easily making it difficult for you to continue the entire day without you feeling worn out and tired. If sleepless nights are a new thing you are going down with one might suspect anemia behind the reasons of it. Anemia causes insomnia. Colds are viral infections that typically will go away--with or without treatment from a doctor--in about 14 days. They generally do not require antibiotics, which are not designed to treat viruses, only bacterial infections. But some symptoms are red flags that your cold might be turning into something more serious. We'll look at eight cold symptoms that should make you consider seeing a doctor. If you are suffering from a cold and you begin to feel lightheaded or dizzy, or if you actually faint, you should seek medical attention immediately. Drainage can sometimes cause vomiting in people who have developed a cold. Usually resting the stomach and then slowly reintroducing only clear liquids such as water, apple juice, or sports drinks will help ease vomiting in people with colds. But if vomiting persists or becomes very severe, you should see your doctor immediately. Persistent vomiting can lead to dehydration, which can be dangerous. Coughing is part of having a cold, but this symptom should disappear in about 10 days after you first begin experiencing cold symptoms. If your cough is still hanging around after 10 days, it's time to see a doctor to ensure that your cold has not developed into bronchitis or some other type of infection. When you've been coughing for days from a bad cold, you might think it's natural for your chest to be sore. However, if you experience chest pain that fluctuates with breathing--a condition called pleurisy--you may be developing pneumonia. You should see a doctor immediately. As with chest pain, a prolonged high fever can be a sign that your cold has turned into another kind of infection. Fevers over 102 degrees in adults and 103 degrees in children are a symptom of pneumonia or other serious types of infections and require medical attention. If you're dealing with a cold, you may be familiar with the "brain fog" that comes from dealing with inflammation in your sinuses and the side effects of some cold and flu medications. If this "fog" turns into confusion or disorientation, however, you should have a friend or relative take you to your doctor's office or to the nearest emergency room. Experiencing shortness of breath or difficulty breathing after you've developed a cold can be a sign that your cold is actually a more serious condition. This symptom is commonly seen in people who have pneumonia, which can be life-threatening if it is not treated immediately. One of the only good things you can say about a cold is that the longer you have it, the less severe its symptoms get. 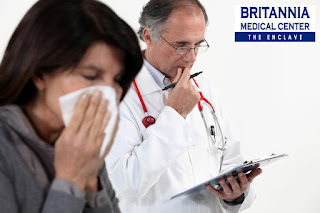 If your cold appears to be getting worse instead of better, or if you've experienced some improvement and then suddenly feel sick again, it's time to visit your health care professional. ARE COUGH AND COLD A SYMPTOM OF HEART DISEASE? Nowadays, it’s expensive to be sick. That’s why people are vigilant about taking medicine for cough and cold as soon as they feel the symptoms of a brewing illness. You might think what you are feeling is just an incoming flu, but what if it’s something much worse? What if what you are experiencing is actually a symptom of a heart disease? Here’s what you need to know if that hacking cough of yours is a sign of a cardiovascular problem. Are Cough and Cold Related to Heart Problems? Flu, which is sometimes confused for cold, lists coughing as one of its symptoms. Which is why, at times, people take cough and cold medicines with the thought that they are preventing themselves from developing flu. However, what would happen if your cough is hinting you at a different disease altogether? Aside from flu, different diseases list cough as a symptom. One of which is heart disease. Although cold is not currently listed as one of its symptoms, coughing can be an indication that you have an underlying heart problem. In most cases, coughing doesn’t necessarily mean that you have heart disease. 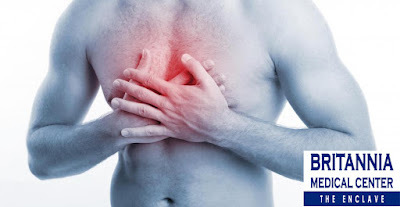 However, if you are already at risk of developing serious heart problems, then coughing can be a sign of fatal illnesses concerning this cardiovascular organ like heart failure. If this is the case, watch out for a persistent cough that produces white or pink sputum. Chest Pain. If you are feeling a pain or tightness in your chest, it might be an indication of an underlying heart problem. If this happens for several minutes, visit your doctor immediately; it might mean that you are having a heart attack that can result to heart failure. Watch out because sometimes this chest pain can move and spread towards the rest of your body. In some cases, instead of chest pain, patients feel pain in their arms which serves as the only indication that they are having a heart attack. Dizziness or Lightheadedness. A lot of factors can make you feel faint or dizzy. Sometimes, it’s just because you stood up too fast or maybe you forgot or skipped a meal. These are easily remedied. However, if your lightheadedness is accompanied by other things such as chest pain as well as shortness of breath, it’s time to call a doctor. This might mean that your heart is not pumping regularly resulting to a drop in your blood pressure. Unexplained Weakness or Exhaustion. In some cases, pain doesn’t warn you that you have a heart disease. Sometimes, your warning comes in the form of unexplained weakness or exhaustion. Do you feel exhausted after doing something that you normally have no problem doing before? For instance, climbing up and down the stairs used to be a piece of cake for you. Then all of a sudden, you feel tired or weak after doing it. This can be a symptom of heart attack so make an appointment with your doctor straightaway. Don’t immediately assume that your cough is an indication of flu. It might be something else, like an underlying heart problem. In this case, taking medicine for cough and cold might not be helpful. If you have a long lasting cough partnered with any of the symptoms above, visit your doctor immediately. To be safe, consult a doctor as soon as you experience one of the symptoms stated above. Of the five senses, it is sight we tend to rely on the most. Through these twin orbs, we see the world in dimensions, colors and shapes. Unfortunately, diabetes is not confined merely to the endocrine system; it can also affect different parts of your body from your eyes to the heart and yes, even your eyes. Of course, taking medicine for diabetes can help but to learn more about the possible complications diabetes can cause, here they are. Most people would associate the blurriness of their vision with nearsightedness, farsightedness, or aging but if you are a diabetic, you must consider your illness to be the possible cause of your eye problem. When your blood sugar is high, it causes swelling in the lens of your eyes. As a result, your vision becomes blurry.In order to correct your blurred vision, you have to lower your blood sugar to normal range. In some cases, blurred vision is not only caused by high blood sugar level. Sometimes, it’s a symptom of more severe eye problems caused by diabetes. If you notice your vision blurring, don’t just work to get your blood sugar level down to your normal, contact your doctor as well. Your eyes have lenses which are supposed to remain transparent to give your a clear vision. Unfortunately, these lenses can fog or cloud up, giving you impaired vision. 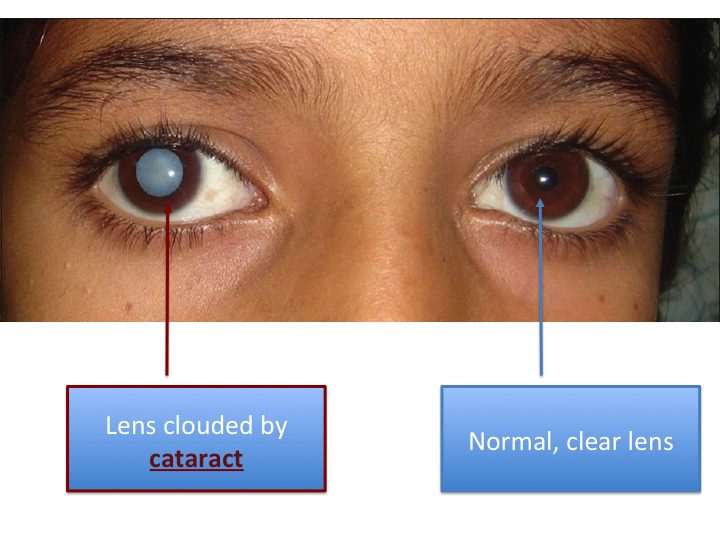 This is called a cataract and it mostly occurs to people advanced in age, but diabetics have an increased risk of developing these foggy lenses. At an increased risk of 60%, diabetics need to be aware of the symptoms such as increased sensitivity to light, seeing “halos” around light sources such as lamps, double vision, blurred vision and color fading. If you suspect you may have developed a cataract in your eye, consult a doctor. 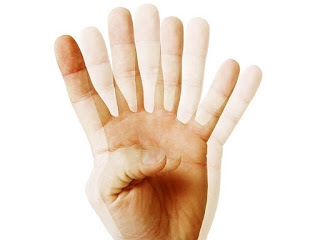 If the patient can still move about without any vision problem, the ophthalmologist is most likely to recommend regular follow ups and monitoring, especially since the condition progresses faster in diabetic patients. They may also be required to wear anti-glare sunglasses. For patients with severe cases, the most effective treatment is cataract surgery, also called phaecoemulsification. During the procedure, the affected lens is removed and replaced by an artificial lens. Retinopathy is a general term used for a disorder of the retina caused by diabetes. There are two major types: nonproliferative and proliferative. The former is a more common form of retinopathy, wherein the capillaries in the back of the eye balloons, forming a pouch while the latter occurs when new blood vessels start growing in the retina. There are different treatments available for people with retinopathy, but these treatments are more likely to be successful when this eye condition is diagnosed early on. Excess pressure in the eyes is a condition called glaucoma. 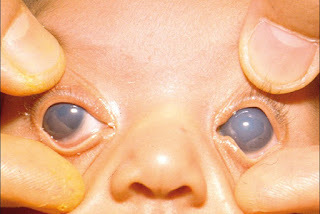 This pressure is usually a result of the fluid in our eyes not draining properly. Diabetics are 40% more likely to get this eye condition compared to people without diabetes. Glaucoma occurs when the nerves and blood vessels in your eyes are damaged by the excess pressure. Symptoms include blurry vision, light sensitivity, pain, nausea and headaches; however, not all cases may exhibit these symptoms as it all depends on the type the patient has. There are three main types of Glaucoma: open-angle, angle-closure and congenital. With open-angle, the vision loss is gradual, with the patient not noticing the signs until irreparable damage has occurred. On the other hand, angle-closure is the sudden buildup of fluid, which may be quite painful with the increase of pressure. When this occurs, one must the visit the doctor immediately. 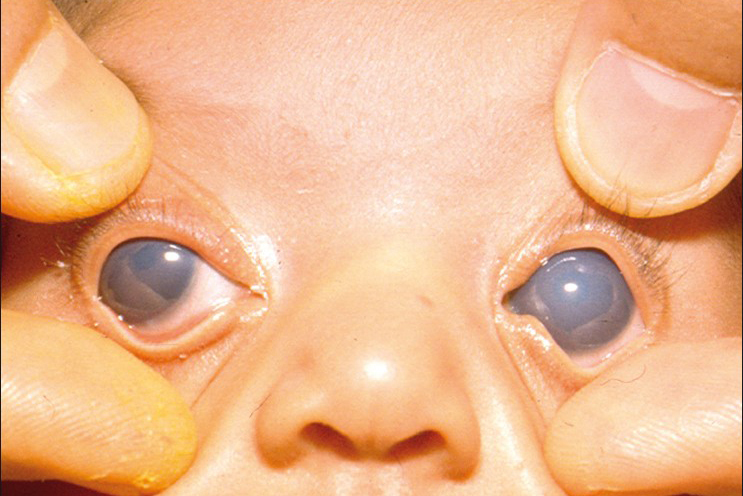 Congenital glaucoma occurs in children who are born with the defect in their eye. There are different treatments available for glaucoma. 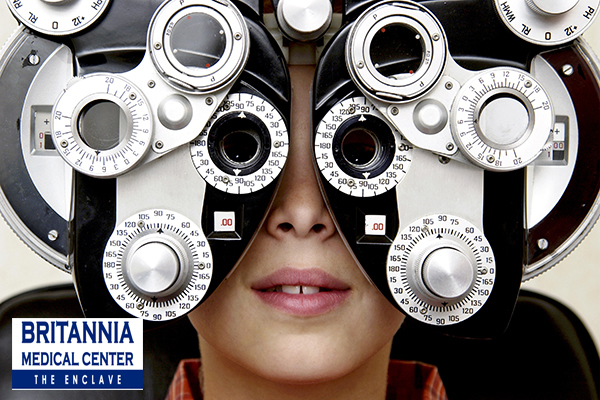 Eye drops, laser procedure, or surgery are available to reduce the pressure in your eyes. Having diabetes might lead to different eye problems. It’s the beginning of 2016 and you may have already begun to think about your New Year’s resolutions. You may be considering resolving to save money, get a better job or lose weight. Many people set new goals about having a healthier lifestyle in the New Year. 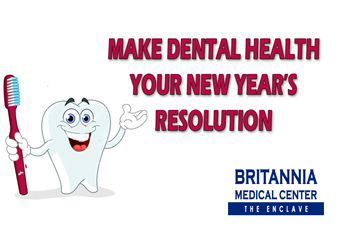 Why not make one of your New Year’s resolutions improving your dental health? Britannia Medical Center - The Enclave can help you do that. You may already know that excessive alcohol intake can have an effect on your overall health, but did you know that it may also affect your oral health? Those who smoke, eat poorly and consume excessive alcohol also have increased gum recession (periodontal pocketing). It shows that smokers who regularly consume alcohol are less likely to brush their teeth on a regular basis and are less concerned about their basic health than non-smokers. Brushing and flossing protect your teeth from decay and gum disease, which is caused by your teeth’s most persistent enemy, plaque – a sticky, colourless, invisible film of harmful bacteria that builds up on your teeth every day. Both brushing and flossing are equally important for good oral health: nly flossing can remove plaque from between teeth and below the gumline, where decay and gum disease often begins. By seeing Britannia Medical Center - The Enclave dentist at least twice a year, you can help prevent any dental health problems before they cause discomfort or require more comprehensive or expensive treatment. Regular visits allow your dentist to monitor your oral health and recommend a dental health regimen to address areas of concern. Book your appointment now and have the smile you’ve always dreamed of in 2016!